The discovery of the algorithm by Bruno Buchberger in July 1965, the so-called Buchberger algorithm used to compute Gröbner bases of ideals of the polynomial ring, led to the birth of the exciting research area in modern mathematics called computer algebra. The 8th Mathematical Society of Japan Seasonal Institute (MSJ SI 2015), entitled The 50th Anniversary of Gröbner Bases, was held in July 2015. This volume contains the proceedings of MSJ SI 2015 and consists of 14 papers related to computer algebra, algebraic statistics, D-modules, convex polytopes, and toric ideals. 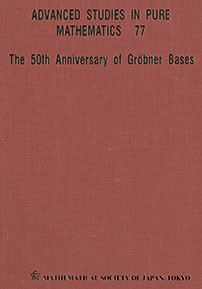 These papers enable readers to explore current trends in Gröbner bases. Young researchers will find a treasury of fascinating research problems which are pending. The foreword was contributed by Bruno Buchberger and includes a secret story on the discovery of the Buchberger algorithm. Published for the Mathematical Society of Japan by Kinokuniya, Tokyo, and distributed worldwide, except in Japan, by the AMS. Volumes in this series are freely available electronically 5 years post-publication. Graduate students and researchers interested in Gröbner bases.